I’m very excited to be able to share with you the plans for my show garden at RHS Cardiff this year. I’ve been alluding to it for some time so it’s great to finally be able to show you the design and tell you more about it. The garden is sponsored by Victoria Park Mazda in Cardiff and coincides with the launch of the new Mazda 2 which is celebrated for its eco-credentials. As you know, I’m really passionate about front gardens so being presented with the opportunity to show case one at the show was really exciting. I wanted the garden to demonstrate that it’s possible to create a stylish and uplifting space that looks great whilst fulfilling all the practical requirements that modern day urban living demands. Sure they need to be functional and practical, especially if you have to park cars and house wheelie bins, but they should also make you smile when you come home and give your house some kerb appeal. Since I put together the initial design, we have also received some other generous sponsorship. CED Stone Group will be lending us the stone and aggregate and Sydenhams in Southampton have agreed to sponsor all the other hard landscaping materials. 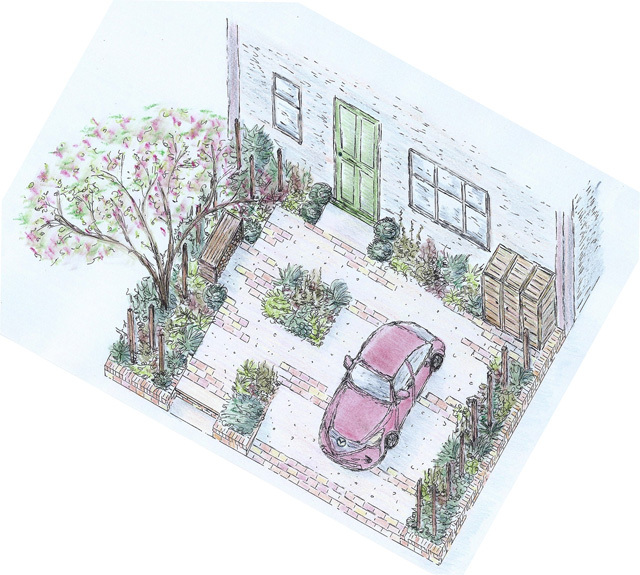 The garden will be built by one of my regular landscapers (from my Surrey days), Scott Hadley of SH Landscapes so I’m looking forward to working with him at the show. And Jonathan Blackburn, garden joiner extraordinaire, will be making the bench seat and bin storage. I’m now working to source the plants including lots of potted spring bulbs – this is proving to be more of a challenge than I’d thought, but I’m not done trying yet – I’m determined to find them! It’s amazing how things pan out as the opportunity to exhibit at the show came from a conversation I had with Andrew Fisher Tomlin when we were in Holland. This led to him putting me in touch with Cardiff Show Manager, Katie Draper who was looking to put a few designers in touch with Peter Marshall at Victoria Park Mazda. I thought I’d do the show perhaps in a year or so, but what better way to start my business re-launch in Wales – I’m certainly up for the challenge! I’ll be blogging more about the show over the coming weeks so I hope you enjoy the journey with me. And who knows, I may even see you at the show!? This looks fabulous, Lisa. I am so excited for you! Good luck tracking down those bulbs and look forward to seeing more as the project progresses. Looking forward to working with you and all others involved and hope it’s a great success for all. Thanks Paula, looking forward to working with you too!